The Marists looked for inspiration at Notre Dame High School in Harper Woods, Mich., as they made plans to open Notre Dame Preparatory School in Pontiac. The Society of Mary (Marist Fathers and Brothers) agreed to establish Notre Dame Preparatory School and Marist Academy at the request of the Archbishop of Detroit. He made the offer to Fr. Joseph Hindelang, s.m., Provincial Superior of the Marists, based on the excellent education offered by the Marists at Notre Dame High School in Harper Woods. The site offered in northern Oakland County was built as Pontiac Catholic Central High School which opened in 1968, when two Pontiac area schools, St. Michael and St. Frederick, merged. In 1988, the school was renamed Oakland Catholic High School but the new name did not revive enrollment and the school closed in June 1994. Pontiac Catholic opened in 1968 after St. Michael School and St. Frederick School, shown here in 1923, merged. In the spring of 1995, 22 seniors crossed the stage as Notre Dame Prep’s Class of 1995, the next chapter in this story began at the Pontiac campus. The original plan for Notre Dame Preparatory School and Marist Academy included the establishment of a middle division. The work of creating the middle division had its own humble beginnings. The planning began with soon-to-be principal Sandra Favrow, a desk, a pad of paper and a pen. One year later, in August 1996, Notre Dame opened its doors to students in grades six, seven, and eight, including the younger siblings of 39 Notre Dame Prep students. Under the veteran leadership of the Marist Fathers and Brothers and Favrow, Notre Dame Marist Academy welcomed 162 students to join the Notre Dame family. Notre Dame Prep students pose with school sign shortly after the school opened in 1994. In four short years after opening its doors, Notre Dame was proclaimed to be the “miracle school” by Adam Cardinal Maida, head of the Archdiocese of Detroit. The Class of 1998 was the first to spend a full four years at NDP. The remarkable success of the young school came through clearly in the accomplishments of the class. The graduation of those 88 students brought the school’s first acceptances to the University of Notre Dame, Northwestern University and Boston College. The class also was NDP’s first to eclipse $1 million in college scholarships. In addition, the class helped usher in the now-thriving theater and band programs, launched a first-class service project by spending nearly 400 hours restoring a home in the city of Pontiac and won the school’s first regional championships in athletics. The Class of 1998 also included NDP’s first National Merit Scholarship finalist and an All-State First Team selection in athletics. The school’s remarkable story took another unexpected turn in 2003. In an era when closing and consolidating Catholic schools was commonplace, Notre Dame ventured out and opened an elementary division. Notre Dame’s lower division took root in a location with a history of Catholic education. Notre Dame Marist Academy – Lower Division opened on the campus of St. Benedict School and Parish in Waterford. St. Benedict School once was a strong feeder school to Pontiac Catholic, Oakland Catholic and Notre Dame Prep, but in the early 2000s was struggling to survive. In April 2003, the Marists agreed to open the school. Throughout the following summer, volunteers and workers from Notre Dame turned out to help prepare the building, and on September 2, 2003, the Marists, Favrow and the staff welcomed 110 new students into the Notre Dame family. Before long, Notre Dame Marist Academy – Lower Division students began to outperform their peers on the IOWA Test of Basic Skills, but more importantly, embraced the mission of being “good Christian people and upright citizens” in a rigorous learning environment that challenged students in academics, leadership, art, athletics, service and prayer. In 2013, Notre Dame’s lower division moved from its Waterford location to a new facility on the same campus that houses the upper and middle divisions in Pontiac. The early success of Notre Dame provided the foundation for the tremendous growth to follow. The students at Notre Dame continued to thrive because the Marist Fathers and Brothers, the school’s faculty, and families in the community have continued to look for opportunities to grow. In the time since the founding of the school, Notre Dame has developed one of the most respected arts programs in the area, was recognized as a Top 50 Catholic School by the Catholic School Honor Roll four times, received the prestigious Exemplary Athletic Program Award by the Michigan High School Athletic Association, and became the first Catholic school in the nation to offer all three levels of the International Baccalaureate. Today, more than 1,100 students attend classes at Notre Dame’s Pontiac campus. In 2013, the school’s lower division moved from Waterford to a new facility on the Pontiac campus. In 2016, Notre Dame Preparatory School was named the top Catholic school in the State of Michigan for 2016, according to Niche, a national organization that annually ranks colleges and K-12 schools across the country. Niche also rated Notre Dame the 7th best private high school, religious or non-religious, in the state. Cranbrook and Country Day were ranked one and two, respectively, on the list of all private schools. According to Niche, the 2016 Best Catholic High Schools ranking provides a comprehensive assessment of the overall experience at a Catholic high school. This grade takes into account key factors such as the strength of academics, school culture and diversity, as well as student and parent reviews, in an attempt to measure the overall excellence of the school. In July of 2014, NDPMA completed the acquisition of property, buildings and other assets from the Archdiocese of Detroit. 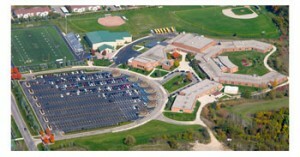 As a result of the transaction, ownership of the property, buildings and assets of the school has been transferred from the AOD to a Michigan non-profit, tax-exempt educational corporation called Notre Dame Preparatory School and Marist Academy, which is governed by the school’s Board of Trustees. The Catholic sponsorship and educational-program management by the Marist Fathers continue at the school as before. All academic, athletic, art and other programs as well as the school’s administration, faculty and staff also continue without change. Today, Notre Dame's graduating classes routinely earn more than $10 million in college scholarships and average five acceptances per year to the University of Notre Dame. Much like Fr. Colin encouraged a Marist-sponsored education to be “a second creation,” all three divisions of Notre Dame have given the legacies of Notre Dame High School, Oakland Catholic, Pontiac Catholic and St. Benedict School renewed life through today’s students. The school originally opened its doors through the sacrifices and gifts of countless people and the buildings were built by and handed down by families of Waterford’s St. Benedict Parish and Pontiac’s St. Michael and St. Frederick High Schools. Notre Dame High School in Harper Woods provided NDPMA with a tried and true approach to educating young people as Christians, citizens and scholars. The Marist Fathers and Brothers infused the elite school with a spirit and philosophy of education rooted in a long history of teaching not only in metro Detroit but around the world. The commitment also has come from our dynamic alumni. And alumni from the Notre Dame family of schools continue to share their gifts in the NDPMA community as teachers, coaches, parents, volunteers and donors. Notre Dame’s faculty, staff and coaches currently include many alumni in their ranks. In its relatively short span of time, Notre Dame Preparatory School and Marist Academy has come very far. But with a very solid foundation and a strong legacy, the long-term success of one of Michigan’s highest-achieving independent academic institutions is assured. In early June of 2017, school officials broke ground for a new science, art and technology wing to be built on its main campus in Pontiac. The new facilities planned as part of the "March on to Victory" capital campaign will consist of a one-story science, technology and arts wing to be added to the existing shared middle division and upper division wings. The new wing will house science-laboratory facilities, collaborative-learning classrooms, a robotics lab, a specially designed greenhouse, and a fine arts studio. For a look at the early years of Notre Dame High School in Harper Woods, click here.